I'm proud to offer to you this amazing Yellow Sapphire. While I've often worked with blue, white, and orange Sapphire, this is the first yellow one that I was able to get in my shop's price range and I'm blown away by the color and sparkle. Yes, it is a real Sapphire (like all the gems in my rings) and was mined in Tanzania. The color is a deep canary yellow and the bits of orange that you're seeing in some of my pictures are just caused by light reflection. As you know, the results of great light reflection is great sparkle! They did a wonderful job faceting this small stone to catch all the light. The Sapphire is 6.08x4.88mm, and .57 carats. It's a very cheery piece of sparkle for your finger! The Sterling Silver band was handmade just for this stone. A leaf curls down one side of the ring. The jaunty pear cut Sapphire sits at one side of the leaf and is hugged by three tiny silver balls. 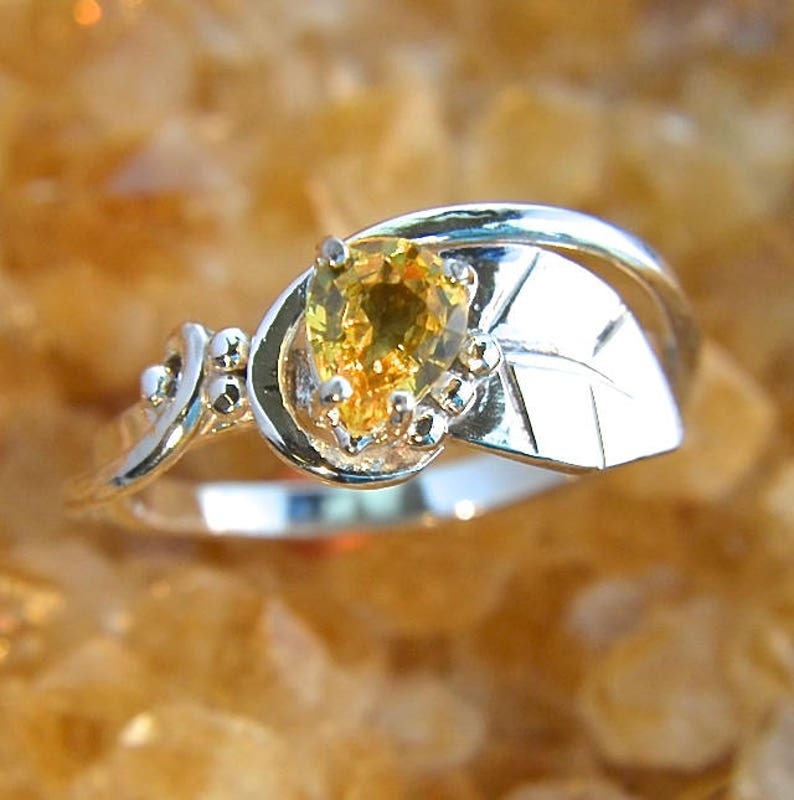 A silver curl cozies up to the other side of the gem then sweeps around the leaf and comes back up the other side of the band. More tiny balls bring it all together. Overall, the band is 8.5mm wide near the stone and 2mm wide on the palm side. Life is too short to wear ordinary jewelry!